The Vauxhall Pleasure Gardens in London (also known as Spring Gardens) were opened in 1661 and reached the height of their popularity in the early 1800s. They were said to be romantic in style in the sense that they were landscaped according to the English tradition of forming naturalistic ornaments, as opposed to the French style with its strong, geometric lines. As such, they became a model for numerous pleasure gardens, including in Denmark, Russia and the USA. As a result, 'Vauxhall' became a generic term for other pleasure gardens. This web page contains information about 'Vauxhalls' outside London. Click here for further information about the original Vauxhall Pleasure Gardens, and the two other original London pleasure gardens. I would be very glad to hear from local historians and others who may have further information - see contact details at the end of this page. The Tivoli Gardens in Copenhagen, Denmark, were opened in 1843 and first called 'Tivoli & Vauxhall' - 'Tivoli' alluding to the Jardin de Tivoli in Paris (which in its turn had been named from Tivoli near Rome), and 'Vauxhall' alluding to the Vauxhall Gardens in London. From the very start, Tivoli included a variety of attractions: buildings in the exotic style of an imaginary Orient: a theatre, band stands, restaurants and cafes, flower gardens, and mechanical amusement rides such as a merry-go-round and a primitive scenic railway. After dark, coloured lamps illuminated the gardens. On certain evenings, specially designed fireworks could be seen reflected in Tivoli's lake. The gardens' character was therefore (and remains) pretty close to that of the original Vauxhall gardens in London. Vauxhall also gave the Russians their word for "railway station" which is pronounced "vokzal". The early-1800s 'Vauxhall' at Pavlovsk was the destination of the first Russian railway line (from nearby St Petersburg) and so the word Vauxhall became synonymous with railway station. More detail is here. Vauxhall Garden in Nashville, Tennessee, USA was "a fashionable place of entertainment which was established by Messrs. Decker & Dryer in 1827 and operated for more than a decade. It covered several acres & included a ballroom, dining hall and miniature railroad." Sydney Gardens Vauxhall in Bath, were much visited by Jane Austen - see 1810 map and modern photo, above. Manchester's Vauxhall Gardens, better known as Tinker's Garden's, were in a natural amphitheatre on the banks of the River Irk in Collyhurst - see the detailed 1848 map on the right and also the second map which shows how, by its publication in 1845, the area was already becoming heavily industrialised. The gardens eventually closed in 1852. Further information is here and a good deal of other information is elsewhere on the web. There was a Ranelagh Gardens in Liverpool between 1722 and 1790 at the top of Ranelagh Street where the Adelphi Hotel now stands. A local history book says that it had 'seats and an orchestra in the centre where entertainments of music, vocal and instrumental, and fireworks, something in the Vauxhall style, occasionally took place, to which the public were admitted on payment of a small sum. The gardens were also a favourite place of resort in the strawberry season for parties who wished to partake of strawberries grown there'. Separately, I understand that the Vauxhall area of Liverpool was named after a house or tavern and small gardens on the Leeds-Liverpool Canal, which was in turn named in turn after Vauxhall Gardens in London. See the advert on the left. But there were no large scale pleasure gardens down here. There were also pleasure gardens in Birmingham - also known as Duddeston Hall Pleasure Gardens - in the valley of the River Rea - see image to the left. The gardens in due course gave their name to the Vauxhall area of the city. William Dargue's website contains a detailed history of these gardens, including the following quotation which suggests that these gardens followed the economic and social trajectory of their London namesake: "These delightful gardens, which contain a very spacious bowling green, an orchestra, a great number of commodious gravel walks, on the borders of which are numerous lofty trees, of various kinds, together with parterres, where flowers of different sorts were accustomed to be seen, were, till of late years, resorted to by none but the genteeler sort of people, and from their retired situation, are every way capable of being made one of the most rural retreats for public amusement of any in the kingdom. Times are now completely changed, it being turned into an alehouse, where persons of all descriptions may be accommodated with that or any other liquor, on which account the upper classes of the inhabitants have entirely absented themselves.". In an echo of Pavlosk (see above) Birmingham's Vauxhall became the site of the city's first railway station. The Vauxhall Gardens in Boston, Lincolnshire opened in May 1815 and closed in 1857. It had a maze, marine grotto, a 'theatre of arts' and 'an elegant saloon'. According to The Book of Boston (Neil R. Wright, 1986. Page 117. ), 'Other places of entertainment were provided in late Georgian Boston for the emerging, rich middle class. Vauxhall Gardens in Skirbeck were opened on 6 May 1815 and covered about two acres laid out in walks with an elegant saloon, 62 feet long, that had a view of Paris and an imaginary hunting scene painted on the sides. A maze was opened in 1825, later a Theatre of Arts or 'cosmorama' with all the wonders of a magic lantern show, and a Marine Grotto about 1840. In 1843 admission cost 6d a day, but season tickets admitting a lady and gentleman and two children cost just 8s. Events laid on to attract customers included an annual evening gala with fireworks and dancing, the annual show of the Boston Floral and Horticultural Society, a Rural Day Fete and an annual Grand Fancy Dress Ball. In 1855 they held a baby show, 'after the style of those held in New York by that king of showmen, Barnum' but the town was less prosperous and Vauxhall Gardens closed in 1857. There were Vauxhall Pleasure Gardens in both Norwich and Great Yarmouth. 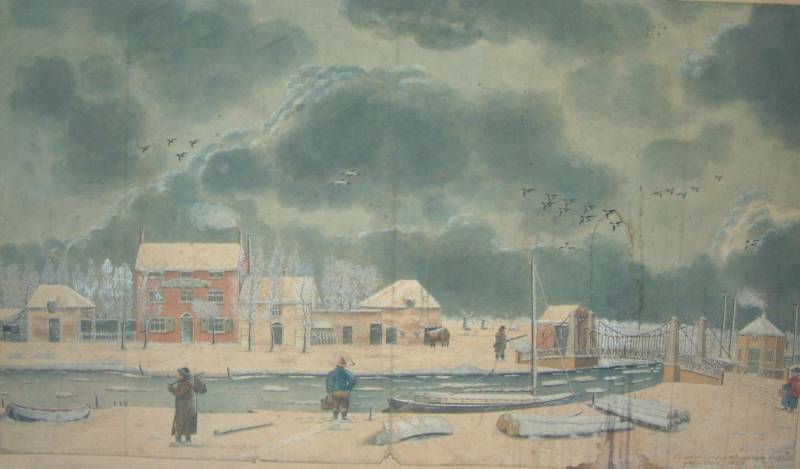 The c.1829 watercolour on the left, of Great Yarmouth's Vauxhall Gardens and Vauxhall Suspension Bridge, is from the town's Museum's collection. The New Vauxhall Pleasure Gardens in Bristol were on the slopes of the hill between Dowry Square and the river. They were opened in the 1700s but were fairly short-lived as Bristolians could see the fireworks and the lanterns in the trees, and hear the concerts, from further up the hill, and were therefore understandably reluctant to pay for entry! There were other problems too:- Newspapers of the time were full of the gardens' owner's apologies for "last Saturday's weather", for a carpenter letting him down, for "enemies" luring his staff away, and so on. It is interesting that Bristol's Vauxhall (pedestrian) Bridge is a little distance away, across the Avon New Cut at the end of Mardyke Ferry Road, with "Vauxhall House" a short distance to the west, between the New Cut and Coronation Road. I do not know why this is. Vauxhall Road in north-east Canterbury. Can anyone help me answer these questions? My contact details are below. Please email Martin Stanley if you can add to the information on this page.